just to include TITLE only, without desc, sub-title, category etc. Is anyone have idea how can be done that? It seems your EPG needs to be <5MB and can't be compressed. It looks easy enough to update the code to add a "&format=short" to the request processor to skip desc, etc., but would it be useful without episode numbering and description? I'd probably want to keep channel tags since presumably your tv uses that to match with the playlist and display channel logos. However, would that make your epg fit the tv limits? Trying it with my OTA, I'd still be around 6MB. (By doing grep -e programme -e '<title' -e display -e icon on my existing xml file as a rough test). 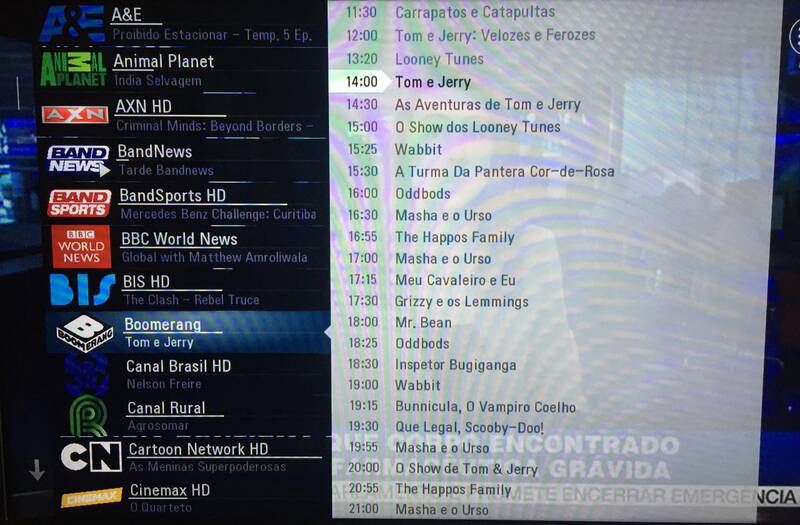 You can add a limit in Tvheadend for how many days epg it keeps in channel->channels, select all, edit, limit epg (days). Perhaps that might help? I don't know if it immediately reduces the EPG days or if it just applies to new updates. The SSIPTV suggests it can get its own EPG and avoid using the Tvheadend EPG, http://ss-iptv.com/en/operators/epg ? It might be easiest to set up some web server, run a crontab to grab the xml from Tvheadend, run the grep above and send the output to a file on the web server. Then you set your tv to get the xml from the web server instead of from Tvheadend. when add &format=short to bash script result is empty file ?? What should be 24 or 72h call? The "&format=short" doesn't exist yet in the code. I meant we can add it to the server if it is of benefit. (In xmltv.c line 159 we'd effectively add "goto done;" before the "if" statement, and add "done:" before line 212 which writes the "</programme>", you can add those two lines yourself if you want to force xmltv to not have those fields since I won't have time to do the proper fix this week). The SSIPTV is a bit confusing, because this topic says it does not use "tvg-id" to link a playlist to the xmltv. So I think it is saying it ignores tvg-id from the .m3u file, reads the channel name "Boomerang", and uses that for the "programme" tags in the xmltv file. But, the programme tags in the xmltv file are tvg-id tags not channel name tags. So, I don't understand how it links the two together. SSIPTV should use the display-name from the channels section to convert the hash to the human readable format, since that is how most of the xmltv files are that I have seen. The reason it is a hash is because it is unique, whereas the forum suggests you can have two channels from different sources with the same name but different contents like "Discovery" being "Discovery (Europe)" or "Discovery (America)" received in the same house. (And I have about ten channels all called "ITV", but are all have different region shows). Have you tried manually changing the file to see if it would process the name correctly? So if "abcdef1234567890" is your Boomerang channel, add a "| sed 's/abcdef1234567890/Boomerang/g'" to your processing line after the grep. Most of other software's use human readable names aka not use hashed name translation.